They ensure the auxiliary production of electrical energy on the isolated sites. Gone up between flanges they function without water loss and preserve the initial pressure of watermain with the minimum of pressure loss. They can adapt without difficulty to the diversity of the installations met in practice. They particularly interest the administrative companies and the local communities concerned with the problems of management and follow-up of the quality of drinking water. Turbines HYDROPOWER can function with a pressure all the more low than the flow can be significant. 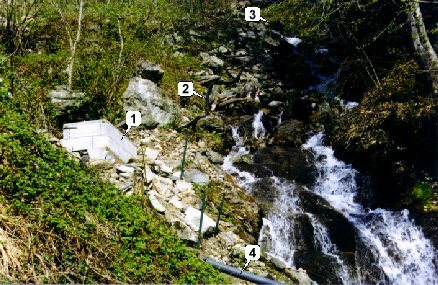 This characteristic makes it possible to easily install them in rural zones, on small rivers where overflow dams low height are frequently found, to regulate the flow. In certain cases a simple contracting of the bed could be sufficient. 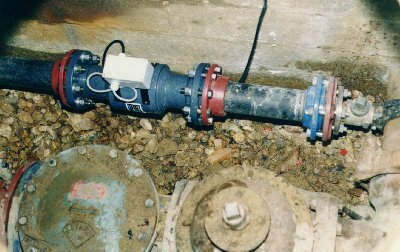 These installations make it possible to locally supply the measuring apparatus height of water and flow, to actuate valves motorized on the channels, to supply the local automatic devices, etc. 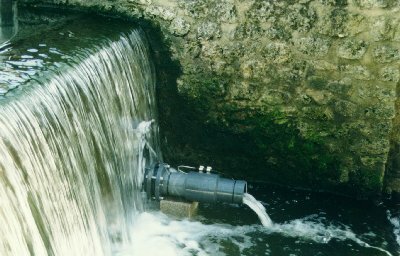 The water collected on a source or in a torrent and lay on the entry of a turbine HYDROPOWER placed at a few meters downwards, by a flexible pipe easy to install, is a source of significant potential electric energy. A power of 100 to 300 W produced permanently and stored by batteries is sufficient to satisfy the minimal need for a isolated cottage, a refuge of mountain, etc. If the hydraulic resources of the site allow it, several turbines can be associated to increase the instantaneous power available.